Jerry has been intrigued with the various forms of martial arts since his youth. 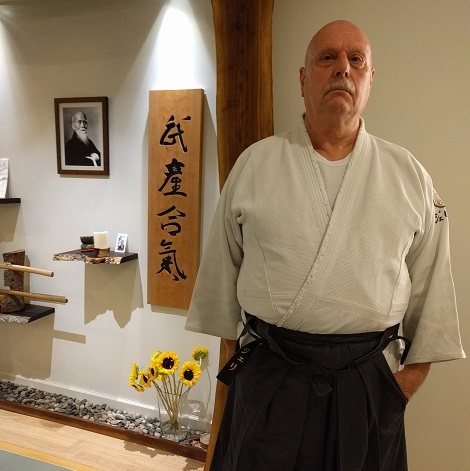 His martial arts journey includes the study of judo, kung fu, and various forms of karate including Korean, Okinawan, Shotokai, Shotkan, GoJu, Moo Duk Kwan, and WuSu. In 1992 he began studying Aikido under Rick Stickles Shihan and continued under Skip Chapman. Jerry's Aikido training has also been influenced by Sensei's Yamada, Kanai, and Chiba. His practice is unique, diverse, and complemented by his vast martial arts influences. A former police officer and Registered Nurse, he has earned a BSN in nursing and a BSA in health administration. Jerry cherishes his time with his wife Helene and his grown children.